Ugly. Yes, we’ve grown accustom to low volatility. And yes, we’ve been seeing and discussing some potential warning signs of the past few weeks. But there’s just no way around it…last weeks price drop was ugly. The only silver lining was Friday’s price action, and even that wasn’t enough to change the inevitable: a trend change from uptrend to downtrend. 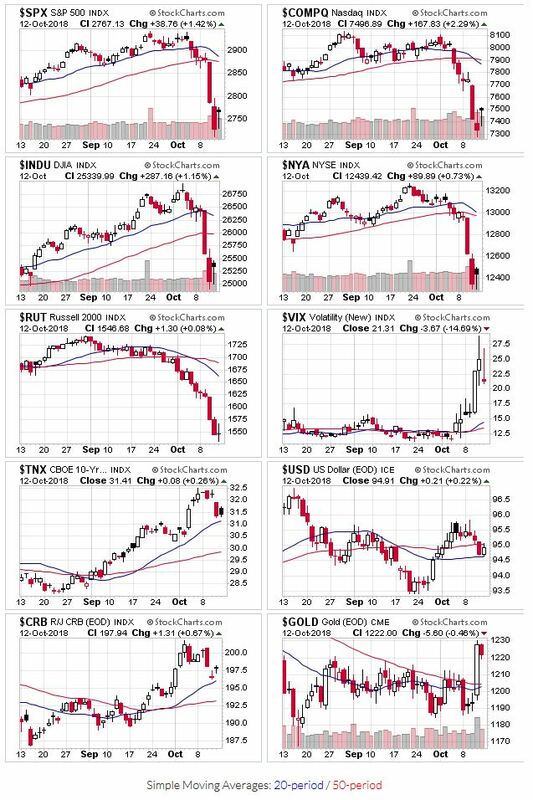 All the indexes start the week below their 20 and 50 day moving averages, putting this signal in a downtrend. The Russell 2000 and NYSE are below their 200 day moving average as well (! 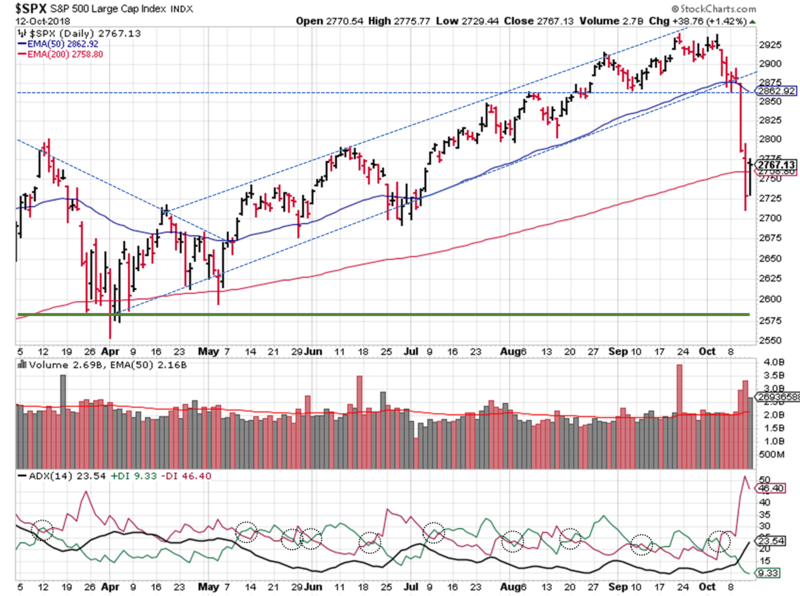 ), while the S&P, NASDAQ, and DJIA found some support at that level during Friday’s trading session. Big percentage sell-offs on high trading volume and weakness in leading stocks shifts the price/volume signal to a downtrend as well. OEW puts us in a downtrend too. Per their analysis, the bull market that started in 2016 is over, and we’re going to see our first bear market in some time. We are now expecting a shallow 15% to 20% bear market lasting several months into next year. In recent years all the selloffs, (2011, 2015/2016, and 2018) have been quite similar…About a 250+ point decline, a 50% retracement, and then a lower low. 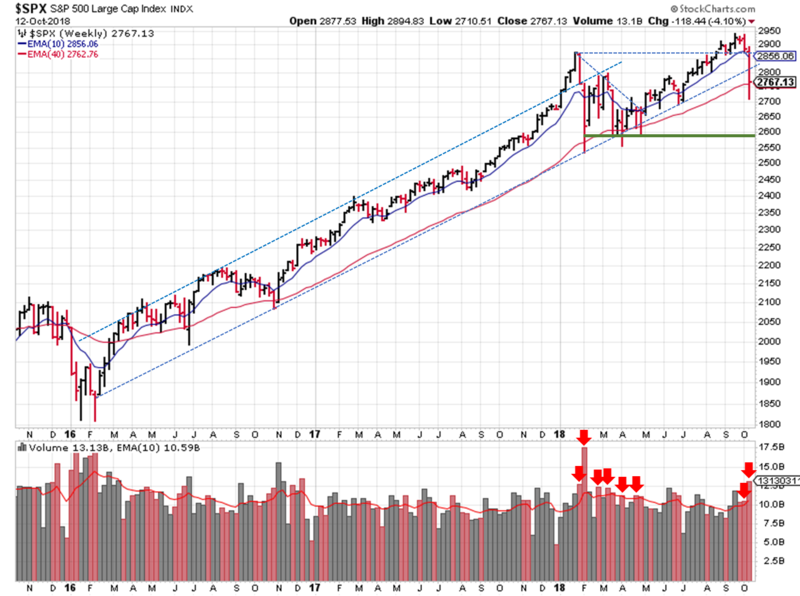 Technically speaking, the S&P ($SPX) took out most of the near-term support levels last week; the 50 day moving average, the January high, and the lower trendline of the price channel. It’s currently testing the 200 day moving average. The ADX broke out, clearly showing the negative trend in firm command. Moving to the longer term view, the S&P broke the trendline that has acted as support all the way back into 2016. This development supports the OEW viewpoint about the end of our 2016 bull market. Now we wait to see if the 200 day can provide support like it did in February and April. Usually a dramatic sell-off is followed by a decent rally…one could argue that started on Friday. And we’re starting Q3 earnings season, which could bolster prices…as long as trade wars and tariffs aren’t used to revise future earnings expectations downward. Given the fast and furious selling, I’m expecting some additional price recovery in the near term, which I plan to use to my advantage before we head lower again…maybe back to the February low.